Believed to be first seen by European American eyes in 1806, the descriptions of what was to be come Yellowstone National Park weren’t believed for over 60 years. After all, tales of “fire and brimstone”, steaming rivers, bubbling mud, and boiling water spouting from the ground are rather far fetched. Even today, nearly 150 years after Yellowstone National Park became the first national park in the US and the world, the tales of geysers, colorful hot springs, and bubbling mud pots read like science fiction. Covering 3468 square miles of northwestern Wyoming – with bits reaching into Montana and Idaho – Yellowstone National Park is home to the world’s largest collection of geysers. In fact, half the world’s geothermal features are located here, fueled by the largest supervolcano on the continent, the Yellowstone Caldera. For the not so daring among us, this means we can add ‘walked on an active volcano’ to our bucket list with visit to Yellowstone. But a visit to Yellowstone National Park is far more than a bucket list check off. 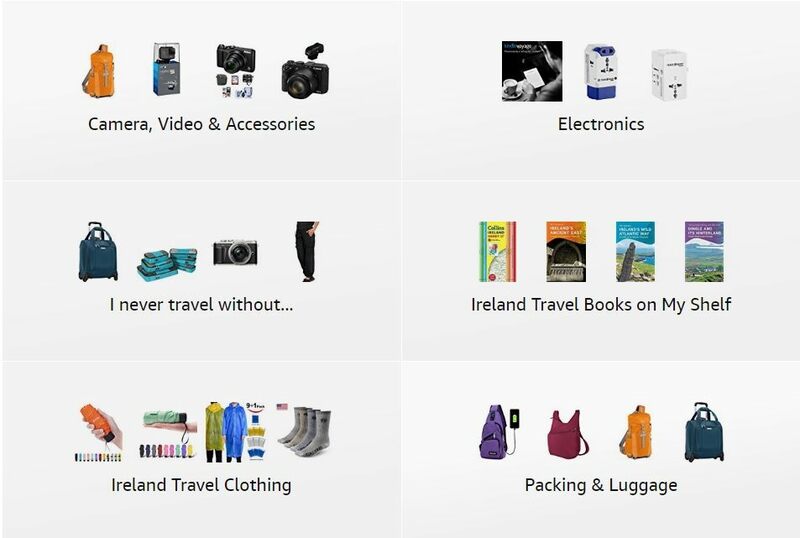 It’s like visiting a foreign country, so different is it from the rest of the US. The wild beauty is beyond compare- and often beyond description. Trees climb mountains to the sky, waterfalls thunder down cliffs, and animals appear, as if from nowhere, disappearing just as rapidly. The only wrong way to visit Yellowstone National Park is to not visit at all. Whether you want a rustic vacation or travel first class all the way, you’ll find your place at Yellowstone. Our visit, in 2012, was with Austin Adventures. Though we didn’t see the entire park (who could? 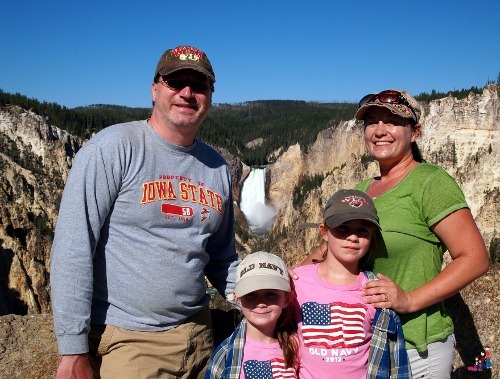 ), our guides took us to the ‘don’t miss’ spots and taught us quite a bit about visiting Yellowstone. 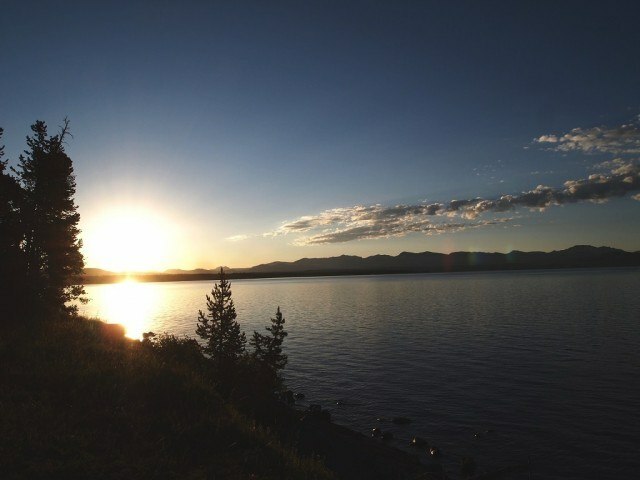 We spent a couple nights at Yellowstone Lake Lodge. It’s one of the older hotels in the park and definitely has that ‘days gone by’ feel. The on-site restaurant is quite good, and the views, well, they are spectacular. Especially at sunrise. To really splurge, book a room at the Old Faithful Inn. 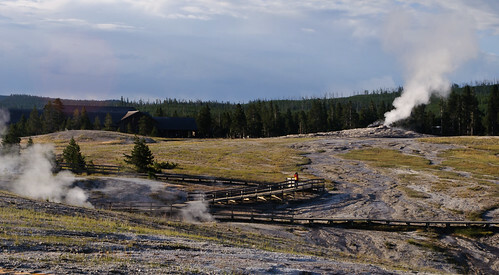 As the name suggests, the inn sits right next to the most famous geyser in the park. But, beyond that, it’s a massive log-cabin-like structure built with imagination. In addition to these, Yellowstone has 7 other lodges, 5 reservation campgrounds, and 7 more campgrounds that are first-come, first served. All in all, there are over 2000 rooms and 1700 camping sites throughout the park. 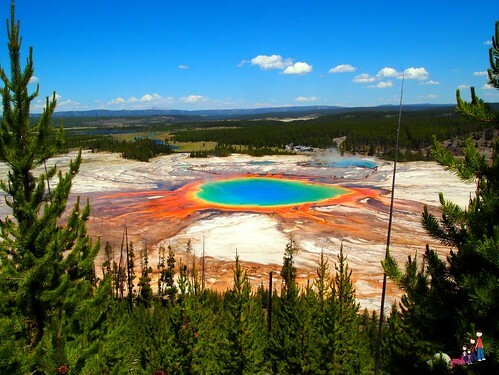 Yellowstone National Park is a paradise of outdoor activities. We went hiking, bicycling, white water rafting, and horseback riding. Of course there are the geysers to view, magnificent canyons to hike, and stunning hot springs to visit. Ranger led activities are popular – and don’t forget that the kids can earn Junior Ranger badges here! In the winter you can add snowmobiling and snowshoeing. No matter where in the park you visit or stay, you will be awed. But, for my money, these three spots are not to be missed. At Artist’s Point- the Grand Canyon of Yellowstone. It’s so perfect, it almost looks photoshopped! Though you can take a boardwalk along the edges of the Grand Prysmatic, the best views are found up the small mountain behind it. Only 10% of visitors to Yellowstone see this view. 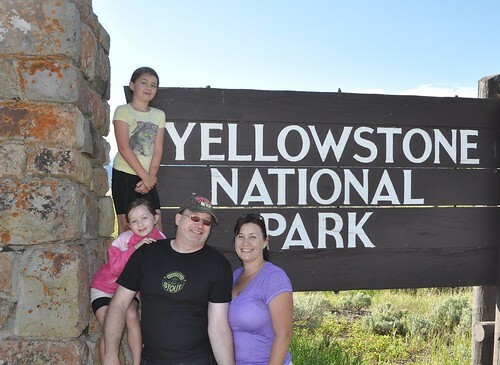 A family vacation to Yellowstone National Park is a trip you will never forget. The park is huge, so I recommend using the online Trip planner if you plan to visit without a guide. Have you been to Yellowstone? What was your favorite spot? I swear Jody, we aren’t meaning to follow you around the world!! This year our family vacation is taking us to Montana, Wyoming and Idaho. 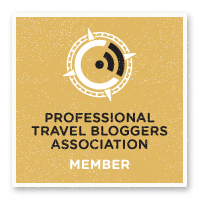 We are visiting Yellowstone, Grand Tetons, Craters of the Moon and Glacier National Parks. Can’t wait for this one either…. What a wonderful itinerary, Amy! How long will your trip last? That’s a lot of miles to take in! Katrina – the Grand Prysmatic is breathtaking and the view you will get from above is nothing short of spectacular. There is a bike path that circles behind the Grand Prysmatic. Park in the first parking area south of Midway Geyser Basin to access the trailhead. It’s a short hike to the steep hill (not quite a mountain) that overlooks the Grand Prysmatic. The climb is steep- and you’ll likely get dusty. Bring water. Maybe some baby wipes. My daughter- who was 5 at the time we visited- was able to climb up. The trails are visible, but not marked. And you’ll likely scramble up, using both hands at times. But the view is completely worth it. A word of caution – keep close track of your kids. This is wild country and the viewing spots are not maintained.